John puts the finishing touches to a Swedish couch upholstered in Bayberry Strie fabric by Brunschwig & Fils. Jonathan Conkey and John Cowie are gearing up for Doors Open Day. 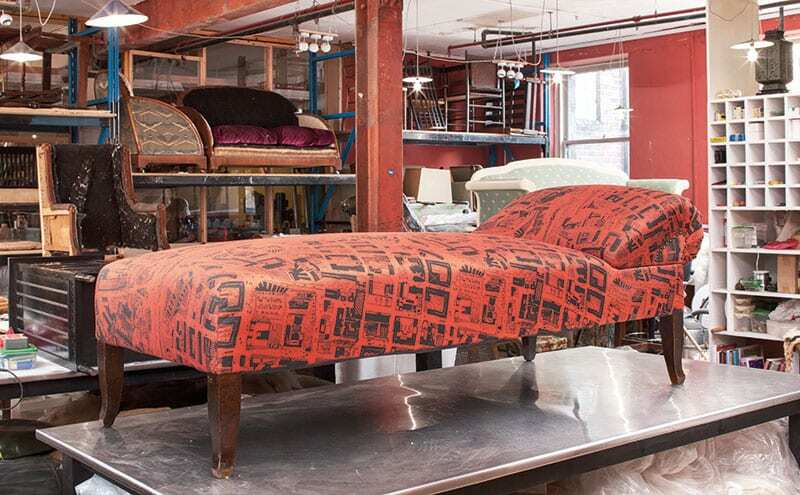 The owners of furniture restoration, upholstery and polishing business the Glasgow Guild, they’re also excited about the work they’ve been doing with the Austrian fabric company Backhausen. 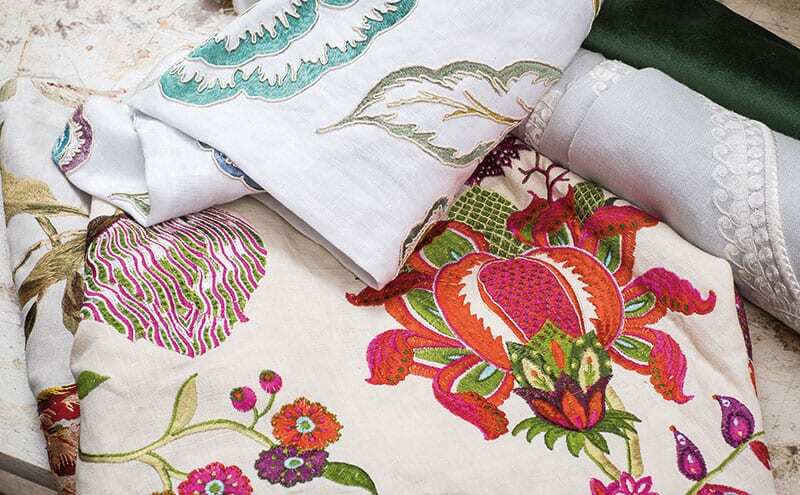 The 165-year-old Viennese institution has a huge archive of fabrics, among them pieces by Wiener Werkstätte designers Koloman Moser and Josef Hoffmann, whose fabrics the Glasgow Guild has used before. In fact, Jonathan and John share a real passion for the Viennese Secession art movement, revelling in its historic links to Glasgow. 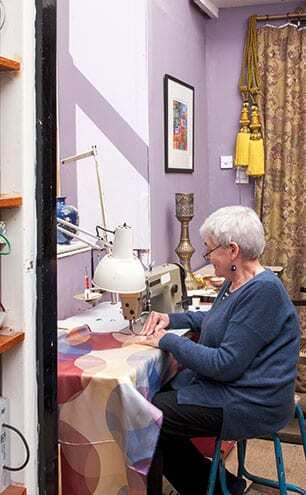 The workshop in Renfrew Street is based in an old print factory that is shared by the Singl-end café. 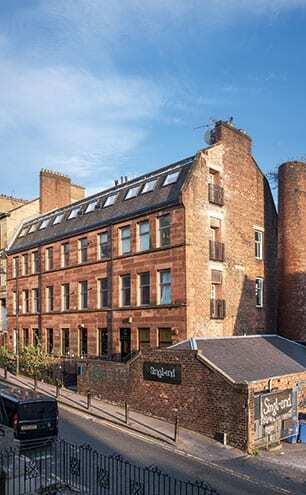 Their furniture business is still in its infancy – the Glasgow Guild shop on West Graham Street, near Cowcaddens, celebrates its fourth birthday this autumn, while the Garnethill workshop has only been operating for the last two years – but already there are plans for expansion. 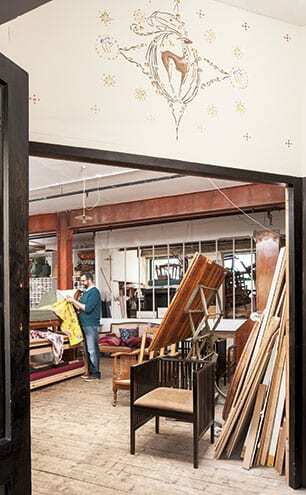 The business marks a new career for both men, who met on a furniture restoration course. Jonathan had been working with the National Trust in Ireland and was looking for a career change. “There were only a few places teaching fur­niture restoration at the time, so I had to make the move to Glasgow,” he says. John, meanwhile, was an engineer. He found himself working in the city’s Blythswood Hotel one day during its refurbishment. “I thought to myself, ‘I should be up there, looking at the beautiful marble hall, rather than down here, inspecting the boiler!’” he laughs. The pair fell in love with the crafts they were learning at the class, so engrossed in their work that they frequently had to be kicked out of the building at locking-up time. “It’s just that sense of transforming something,” says John. [sociallocker id=”20112″]The workshop in Renfrew Street, in what was once a print factory for the stationery firm Lyons, serves as the pair’s studio for the ‘dusty’ work, as they put it. 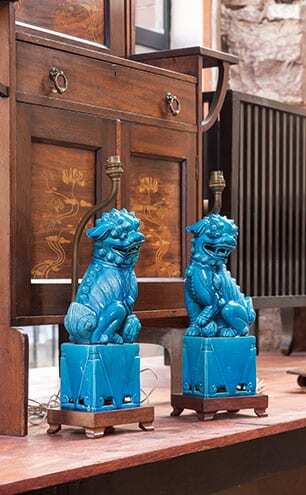 Here, they restore pieces they’ve bought at auctions and salerooms around the country and work on commissions from private clients, and also occasionally host events where specialists such as Dr. Louise Kiesling, creative director at Backhausen, can give talks and workshops to enthusiasts and collectors. Pip is engulfed in fabrics; the Glasgow Guild fabric library covers a vast range of artistic and architectural periods. John recalls walking down Rue Bonaparte in Paris, luxuriating in the artisan textiles on offer in every shop window, when he made up his mind to replicate it in Glasgow. He regularly changes the window displays, sometimes showing off Irish linens by Fermoie, hand-woven silks and brocades by Gainsborough, or the early 20th-century graphic creations of Wiener Werkstätte. It’s a great way to showcase the diversity of their work. 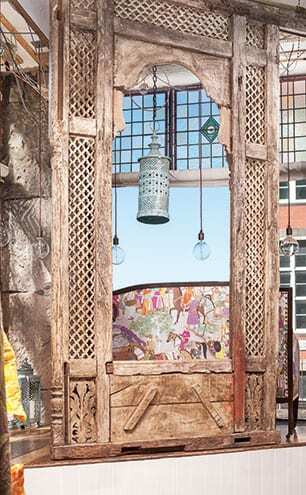 The shop’s Moorish window display, featuring fabrics from Backhausen, Pierre Frey and Manuel Canovas. 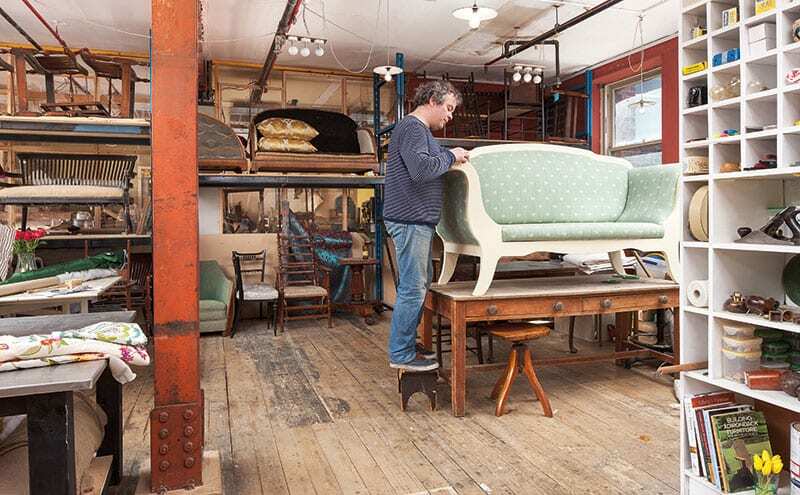 With a dedicated client base, largely drawn from Pollokshields and the suburban enclaves of the west end whose architecture is the perfect setting for the kind of early Arts and Crafts/Glasgow School furniture that the Glasgow Guild specialises in, John and Jonathan often begin with a request to reupholster a single chair and then find themselves dressing entire rooms. “We have other exciting projects on the horizon, too,” says John. “We’re going to be showcasing new designs by Ailidh Lennon, a weaver at Mull’s Ardalanish mill.” The weaver (who used to play bass with Glasgow punk-folk band Sons and Daughters, and is the partner of Idlewild’s Roddy Woomble) has been producing tweeds using shepherds’ patterns uncovered from the local archives.